Queen’s seals found in an excavation site in Seoul. April. 17, 2018 08:17. by Yeun-Kyung Cho yunique@donga.com. Two items of queen’s seals have been excavated, which are believed to have been crafted in the late years of the Joseon Dynasty. 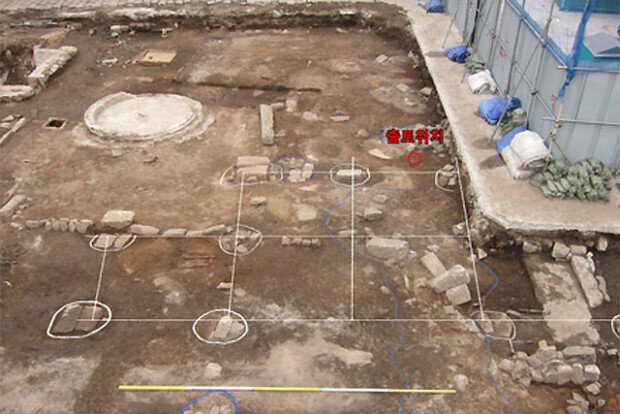 The Research Institute of Seoul Cultural Heritage announced on Monday that it had found a queen’s seal 4cm by 4cm with the length of 5.5cm as well as a smaller seal that is 2cm by 2cm and 2.9 cm long, during its excavation project at Tongeui-dong in Jongno-gu, Seoul. This is the first time for a queen’s seal from the Joseon Dynasty has been found in an excavation investigation in Korea. The square-shaped seal has a word “Naegyo,” which means Buddhism, engraved on it. The seal has a handle on the top in the shape of a dog-like animal, with its forelegs extended and hid legs bent. Located west to Yeongchumun, the west gate of Gyeongbok Palace, the historic site of Tongeui-dong is said to be near Saejaegam, a government office from the Joseon Dynasty in charge of the fish, meat and salt supplied to the royal court as well as Changui Palace, a residence of King Yeongjo before he was crowned. Considering the fact that the seals have been found outside the palace, experts say that the queen’s seals may have been lost or stolen during the turbulence of the Korean Empire era. Currently, the National Palace Museum of Korea is displaying a bronze seal, another smaller seal and a black bamboo case for storage of the two seals. The seals have a knob in the form of a lion.